Kerri Pratt is a visual artist based in the East Midlands and her practice focuses on an exploration of painting processes, manipulation of paint, surfaces, marks and colour. 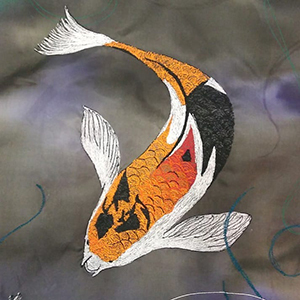 Emily Smalley presents a collection of Japanese-Inspired wall hangings and wildlife art that have come into being when allowing her imagination and creativity to flow freely. In her first solo exhibition, Emily is breaking away from pure photographic study and exploring the origins of her identity as an artist through contextual and medium experimentation. Each wall hanging conforms to the measurements of a tenugui cloth, a traditional Japanese hand towel that is beautifully decorated with a printed pattern or artwork. A special evening viewing is being held on Friday, 26 April from 7pm-9pm and will include light freshments and live music. The exhibition runs from 22 April - 17 May and is open week days 10am-3pm. All work on show is for sale and commissions are welcome.